All your doubts about material miseries and obstacles will be cleared from Bhagavat Gita As It Is by Iskcon founder Acharya A.C.Bhakthivedanta Swami Srila Prabhupad. When I sat down to write this article, I was not sure on how I was going to write it. But one thing I was sure. I wanted to write about the cow herd boy in blue color. The one who attracts all towards him. The one who gets the maximum votes for favourite God. Yes, you guessed it correctly. I want to write about Krishna. The term Krishna means ‘one who attracts everything’. I want to talk about the endless stories of Lord Krishna, the types of relations which he has with different kinds of people, devotional life of Bhaktas and the miracles which he does to his devotees. Above all, I want this to be the best article I have ever written. For that, I need not have anything to do. I just need his mercy and he will do the rest. 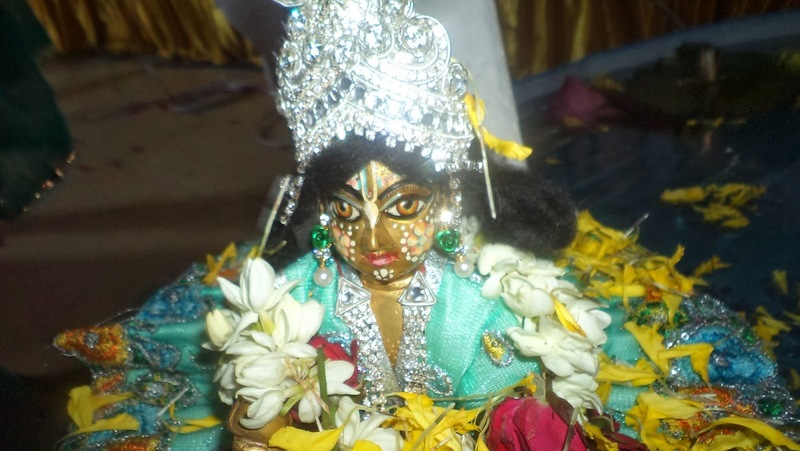 Devotees worship Lord Krishna in various forms. For some, he is Krishna the grown up youth. For some others, he is in the Narayana form, as in Guruvayoor. Even others worship the Lord as Maha Vishnu, the creator of the Universe. Yet another form of worship is that of the cow herd boy Krishna. Indian women wish to have a son like him. Girls love him for his mischievous pastimes. Boys love him as a friend and a great warrior. Whatever relationship we want, God is there to come in that form. If a person loves Krishna as a son, God will come as his son. If somebody want the Lord to be his friend, Lord will be there as his friend. If somebody need him as a lover, Krishna will be there as a lover. We just have to desire and he is there to sanction it. For me, I consider him as the Supreme Soul. Still I call him Kanna, as if he is my pet, a younger brother or a friendly kid. Repeatedly telling “Kanna, I have told you not to do this to me”. It is said that even if one think of Krishna all the time without devotion, for example hatred or fear, he will also be given liberation because he was thinking about the Lord all the time. The best example is that of Kamsa. When we make one step towards Krishna, he will do the rest. He just pushes us in the path of devotion. When we make the first step he just runs to you to take you with Him. The only thing needed is our willingness or desire to love Krishna. Here you can find the numerous names of Lord Krishna and Lord Vishnu explained with meaning. Check out this space to download different Hindu mantras and Krishna Bhajans, lyrics of Hindu prayers and Krishna Bhajans and develop spiritually. Try chanting Hare Krishna Maha Mantra and be happy. I don't believe in soul. Do you? Is there evidence for the existence of soul? Need proof for the existence of soul? What does the Vedas teach us? Learn to recite Vishnu Sahasranamam in a month. How to overcome Anger, Pride, and Jealousy? Copyright © http://krishnavabodham.blogspot.in/ 2013-2014. Copying of content strictly prohibited . Simple theme. Powered by Blogger.